Two major Puget Sound Energy projects are sprinting toward completion in Concrete. Both should wrap up at different points in 2013. 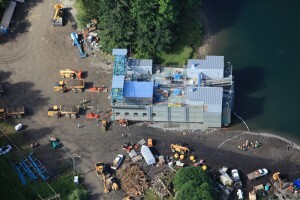 After an unstable slope to the east of the construction site delayed the start of the new power house, the $43 million project was off and running in 2011. PSE officials now are looking at an August 2013 completion date, with no major setbacks along the way. “We’ve been really lucky; we’re doing well; it’s going well,” said PSE Project Manager Scott Rzemien. Construction crews have completed installation of the turbine in the turbine generator and are currently installing the generator portion. Tailrace construction is about 15 percent complete and should be finished in March 2013, said Rzemien. The new power house is mostly underground. When it’s complete, only the top 4 to 6 feet of it will be above grade. The subterranean design is a response to the 1955 landslide that destroyed the first two power houses—Units 1 and 2—that PSE had built upstream from the current site. The new power house will raise the power capacity of PSE’s two Baker River dams from today’s 170 megawatts to 200 megawatts, enough peak output to serve 150,000 households. 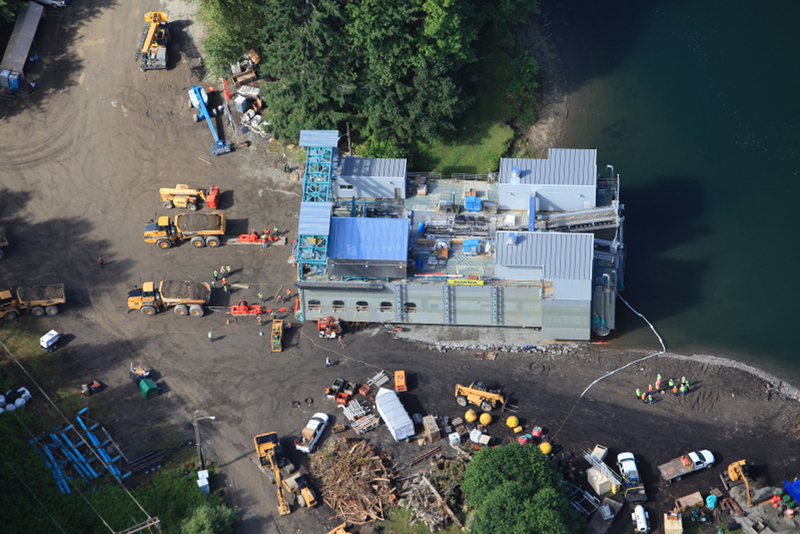 Farther upstream, a floating surface collector was launched into Lake Shannon in late July. The FSC is an approximately four-story metal box that was built on shore, then launched into the lake and floated. Its components include a net transition structure—a pyramid-shaped funnel that comes out of the box—and giant nets that extend to the lake floor and the shoreline. When the FSC is functioning, it will generate a current that will fool young salmon into thinking they’re headed down the Baker River. They’ll be collected in the body of the unit, where some will be tagged. From there they’ll be transported by boat to a new, Skanska-built pier and loaded into trucks for transport downstream.